I have enormous respect for Matt Moore. Before his surgery I thought he was one of the best pitchers in the game and I certainly hope that he continues on his path to a full recovery. New guy Ernesto Frieri made his first appearance with the Bulls. He’s been on the roster for a couple of weeks. He last pitched for the Rays on June 1, so we could have expected some rust. And that’s what we saw. He has almost 300 appearances as a major leaguer and at 29 he probably still has some gas in the tank. Let’s hope he figures out what he needs to figure out while he's with the Bulls and helps the team. Stats. When Frieri came off the DL yesterday, Bradin Hagens was sent back to Montgomery. He is tied with his Montgomery teammates Kyle Winkler and Leonardo Reginatto for the least number of innings pitched by a Bulls this year (3) — that’s assuming Mr. Frieri does not go back on the DL. Former Bull Matt Buschmann pitched 7 innings and took a win for the Louisville Bats yesterday. Guess that means he might be coming back to the DBAP, in a different uniform. Box. Two home runs, by Corey Brown and Luke Maile, were all the scoring yesterday. Columbus pitching simply dominated the Bulls. 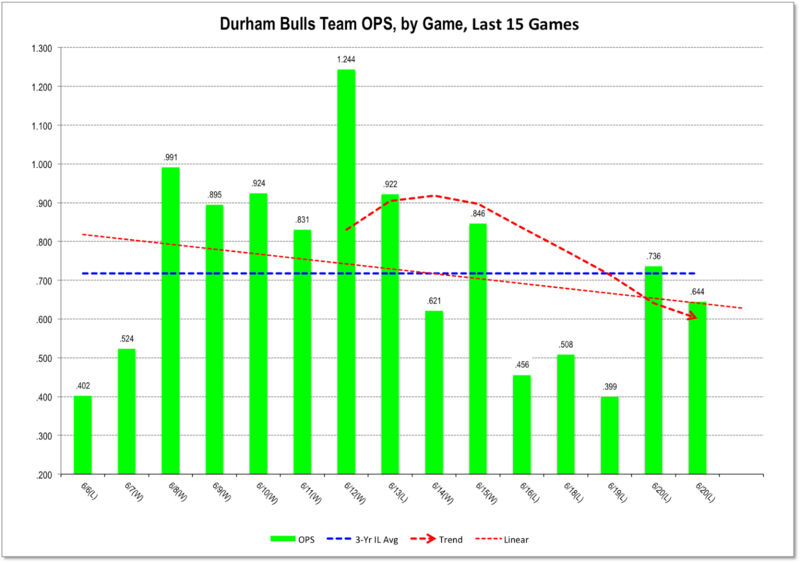 In the last three games Bulls hitters struck out 42 times. It’s a mostly ugly hitting picture in recent days. Pleased to see them leave town and we hope the Bulls take advantage of their day off.